See, I've been there. I've been a to the point where I shunned sunlight and exercise as a child to play video games on the family computer. As it could be expected, I ballooned up pretty quickly and stayed there for years, most specifically the worst possible years to be overweight in a publicly-schooled child's life. That is, the years of middle school and high school - those very years when teasing and bullying reach a high point. But I got out of that. But in a sense I'm still there because only twenty years after "got healthy", I also finally realize that not only is it difficult to choose healthy foods, there are companies and organizations that are working hard to make it difficult! Corporations exist to make money, and corporations whose methods of doing so are to make processed food and drugs only make money when you keep buying more and more processed food and drugs. 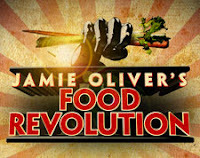 Jamie Oliver's wish fulfillment is what we need right now. We don't need health insurance reform - that's a band-aid applied to a gaping wound. We don't need convenient junk food - that's a twist of the knife already in our back. We most certainly do not need massive corporations working together with government agencies to push new and untested processed "food" on the public at large - that is the equivalent of first-degree murder to our health. Listen to Jamie, and teach our children (and the adults!) to know what real food is. You can only be healthy if you eat real food.